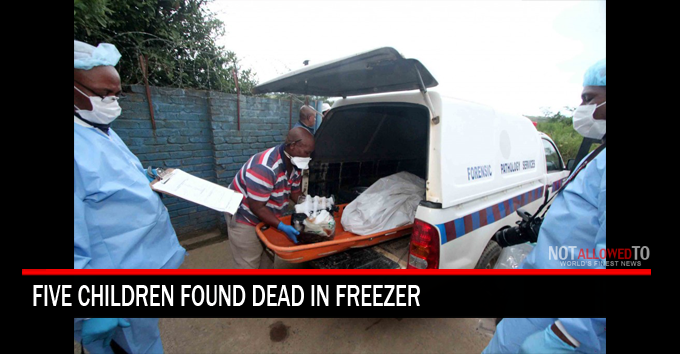 Five children, ranging in age from 3 to 7, were found dead in a locked freezer and were discovered in the evening by their grandmother in Kakamas, in northwest South Africa. Apparently, the young children suffocated inside an old freezer in the yard, police said. The children were believed to have been playing in the freezer when they accidentally got locked inside. Forensic investigators look on as the bodies of babies are loaded into a van on Saturday after they were found inside two fridges where fresh cakes, meat and mixed vegetables were stored in a house. Police have begun an investigation into the deaths of the children, who were cousins.